For true elegance and all the functionality you could ask for, pick up the SMOK X-Priv 225W Kit with TFV12 Prince Tank. The 88mm x 46.5mm x 30.4mm chassis of the X-Priv Mod has a lightweight of 172g and is powered by dual high-amp 18650 batteries (not included). Its frame continues with SMOK’s new wild Cobra style design by adapting a series of prisms on the back side that provides excellent texture for a firm and comfortable grip. The entire front side of the mod consists of smooth, print-resistant glass that has a soft luster and an all around high-class glossy appearance. Like many other SMOK mods, the X-Priv has a three-button interface consisting of a stealthy ergonomic firing button that runs along the entire side of the mod. Located in the bottom front corner of the device are two regulatory buttons that blend in with whichever of the seven different customizable color options you choose from. On the front is a 2.0 inch HD OLED display screen with a user-friendly menu that clearly shows all the vaping data you could ever need. Go to Variable Wattage mode rev up to whatever wattage you want between 1 to 225W. Temperature Control mode allows you to vape with temperatures from 200-600F (100-315C) with Titanium, Nickel, and Stainless Steel heating elements. The convenient Memory mode lets you save your favorite settings so you don’t have to go through the trouble of changing them every time you want to use your device. Aside from your current wattage and temperature, the screen also displays dual battery life indicators, a draw timer, a puff counter, as well as your current voltage and resistance. The X-Priv withstands voltages between 0.5-9.0V, is compatible with 0.5-2.5 ohm coil heads, and has a standby current of less than 500uA. With this kit, SMOK has included a new superior Micro-USB cable constructed of a more durable material that offers quick charging and can be used for firmware upgrades. Safety features for the X-Priv 225W Mod include intelligent atomizer recognition, a puff monitoring system, a 12 second cut off, short circuit protection, over-heating protection, and over discharge protection. 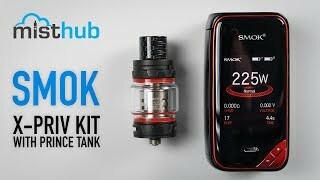 Attached by a threaded 510 connection is the astonishing SMOK TFV12 Prince Sub-Ohm Tank. The Prince Tank has a 63mm height and a 25mm base diameter, composed of a classy superior Stainless Steel finish and durable Pyrex Glass tube. The glass tube that comes on the tank features a bulb-like convex appearance with a 28mm diameter capable of holding a massive 8mL of e-juice. On top of the tank is SMOK’s Wild Cobra Resin drip tip that gives increased airflow and has special tactility for a comfortable feel on your lips. Keeping with their tried and true patented top-filling method, the top cap is released by a push button locking mechanism. The top cap then swivels counter clockwise, exposing the fill port gasket to conveniently replenish your e-liquid levels. This locking system makes the tank extra leak-proof for traveling and on-the-go purposes. The Prince Tank has its own line of powerful, high performance V12 Cores and two of which are included with this kit. Pre-installed is the 0.4 ohm V12 Prince-Q4 quadruple coil rated between 40 to 100W and is recommended for best use at 60 to 80W. Also included in the box is the 0.12 ohm V12 Prince-T10 decuple coil rated for use between 60 and 120W and is recommended for best use at 80 to 110W. At the base of the tank are dual bottom adjustable airflow holes, so you can make a tighter or wider draw depending on the vaping effect you desire. Once again, SMOK astounds the market by releasing the SMOK X-Priv 225W Kit with TFV12 Prince Tank. To keep up with the latest in style and technology, scoop up yours today.